This is no longer an issue since we created the VinoPlease Wine Stoppers. Now instead of being frustrated when you have a half finished bottle, you can feel relief, using our wine caps to seal in the full taste of your wine. Once you remove the cork & re-seal the bottle with the our wine stoppers, your wine is air tight & the bottle can rest on its side or even upside down without leaking. Also, our custom bottle caps are reusable. In fact they're designed to resemble the old wine bungs used to seal wine barrels during the winemaking process in France in the 1800's. 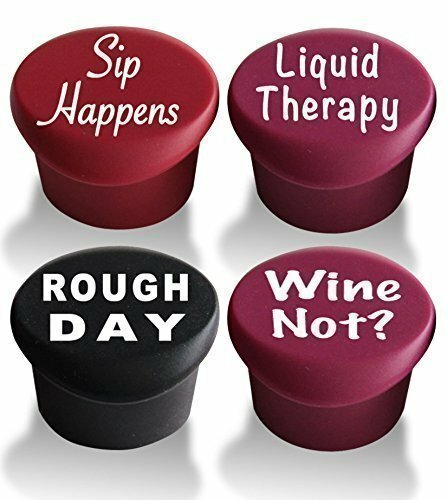 The set of wine toppers arrives with 4 wine sealers with a different funny design on each cap to bring a smile to your face. Made of environmentally friendly FDA approved food grade silicone material that makes our wine caps last a lifetime. Recieve our Wine Lovers Only Guide at no additional cost to you! FRESH WINE FOR WEEKS - Designed to preserve your favorite wines using an airtight and leak proof seal. No aftertaste or oxidation. Reseal and label your wine with ease! VERSATILE - Fits standard wine, beer, champagne, and soda bottles including some larger styles. Use this wine tool to easily store bottles on their side without fear of leakage. ORDER NOW with our 100% SATISFACTION MONEY BACK GUARANTEE. LIMITED TIME Only Special Offer! Order 2 or more to QUALIFY for FREE SHIPPING Today! If you have any questions about this product by Vino Please, contact us by completing and submitting the form below. If you are looking for a specif part number, please include it with your message.